This figure shows an overview of the current temperature at each station in our network. 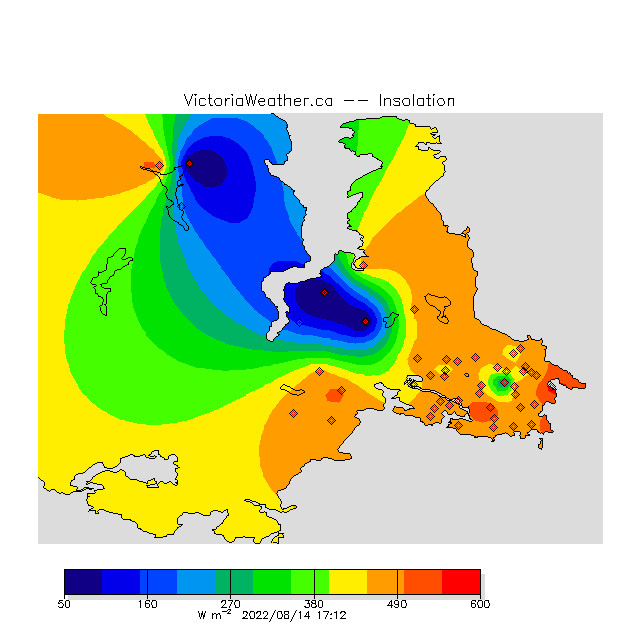 This figure shows an overview of the current dewpoint temperature at each station in our network. This figure shows an overview of the current wind speed at each station in our network. 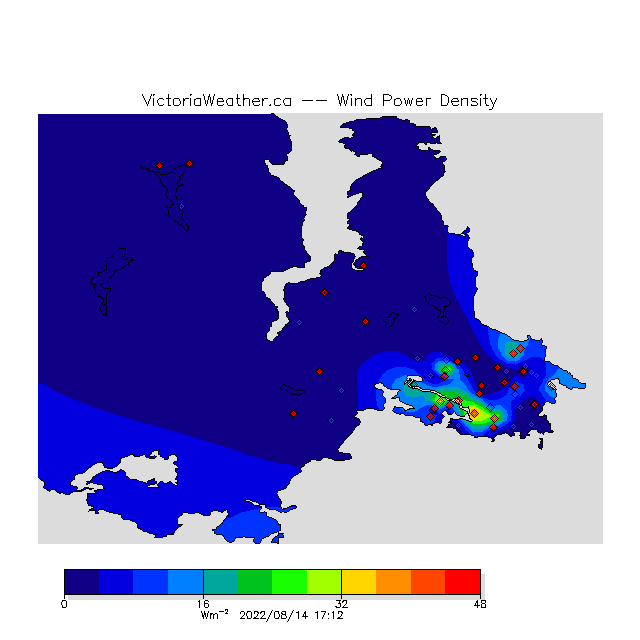 This figure shows the instantaneous wind power density at each station in our network. These values are not available when holding your mouse over the station icons. This figure shows an overview of the current humidity at each station in our network. This figure shows an overview of the current rain amount at each station in our network. This figure shows an overview of the current insolation at each station in our network. This figure shows an overview of the current UV Index at each station in our network. These plots are generated once per minute using data from the previous minute. All of the figures show the locations of active stations with a diamond. 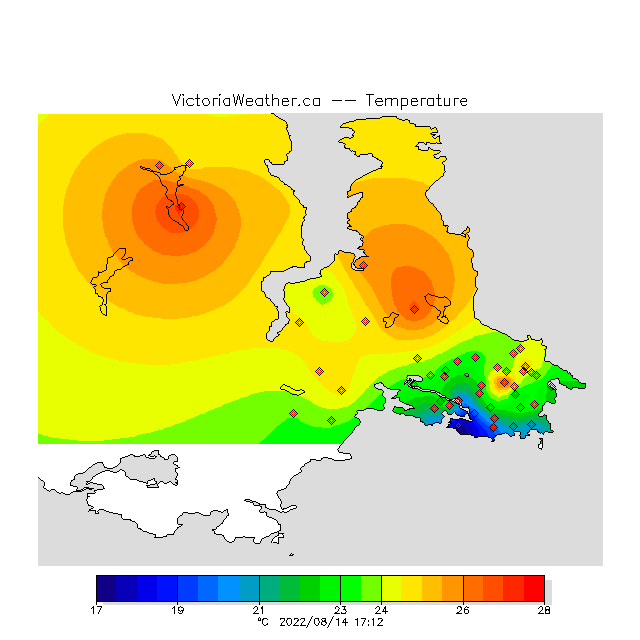 The coastline of the greater Victoria area is shown in black and water is shaded with a light grey. (the Gorge is very apparent). 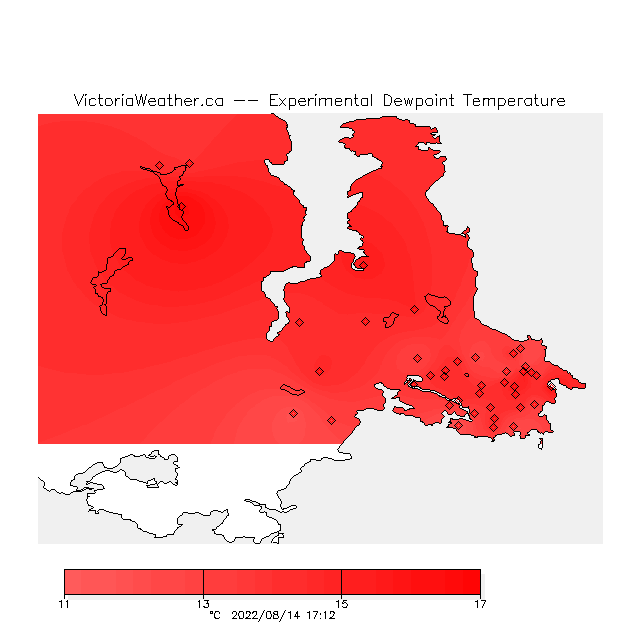 We use a method called Kriging to interpolate values between stations. Values far away from any station and especially those in the corners of the figures should be understood to be estimates created by the interpolation method. On occasion some sites won't send their data in a timely enough manner. When this happens the site is excluded from the plot. This may cause the boundary of the contoured area to be reduced. A brief explanation of each figure follows, but see this page for more information. We are experimenting a bit with different ways of colouring the data to show the most interesting features so these descriptions may change over time. To draw the temperature contours one of two fixed contour intervals is used, either 0.25 °C or 0.5 °C depending on the size of the difference between the maximum and minimum. 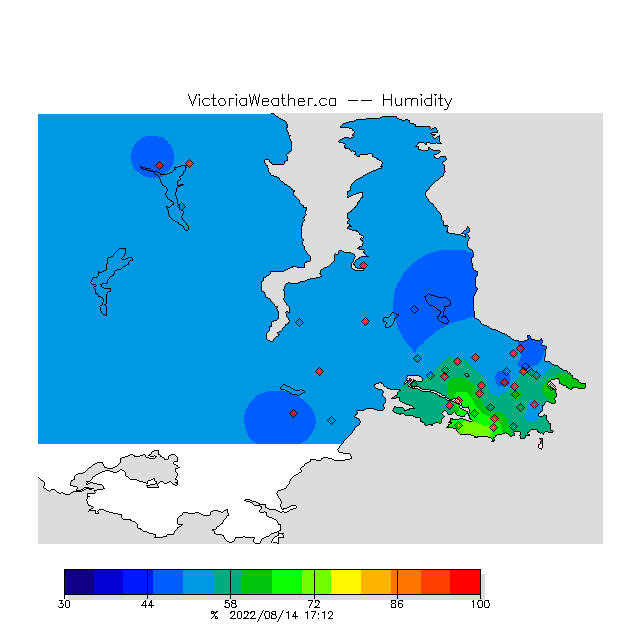 Relative Humidity is plotted with a fixed interval of 10% and a range of 30% to 100%. Dewpoint temperature is the temperature it is predicted that an air mass will have to cool to in order to become saturated with water vapour. Once saturated water will begin to condense onto surfaces in contact with the air. Surfaces that are colder than the dewpoint temperature can cause condensation to occur even if the air in bulk has not (yet) dropped to the dewpoint. If the dewpoint temperature is below 0 °C frost or ice can form on surfaces. This value is determined using a formula that combines temperature and humidity. The formula is a simplified fit to a more stringent model of saturation in air. This value is experimental at this time. We cannot guarantee its accuracy or availability nor can we say with assurance, ever, what regions will experience the potential for freezing. Insolation (the amount of the sun's energy reaching the surface of the Earth as visible light) is measured in watts per square metre. It is contoured with an interval of 20 Wm-2. On a typical bright, sunny, summer day the peak insolation is about 1000 Wm-2. This maximum can be increased by clouds that are nearby but not blocking the sun. These clouds are reflecting light that has already been reflected from the ground back toward the sensor. There is no simple way to convert a radiometric measurement of power to a photometric measure of brightness. Generally however, higher power means brighter conditions. This page (from Wikipedia) has more information. The UV Index is shown with an interval of one and a range of zero to 10. See this page for more information. 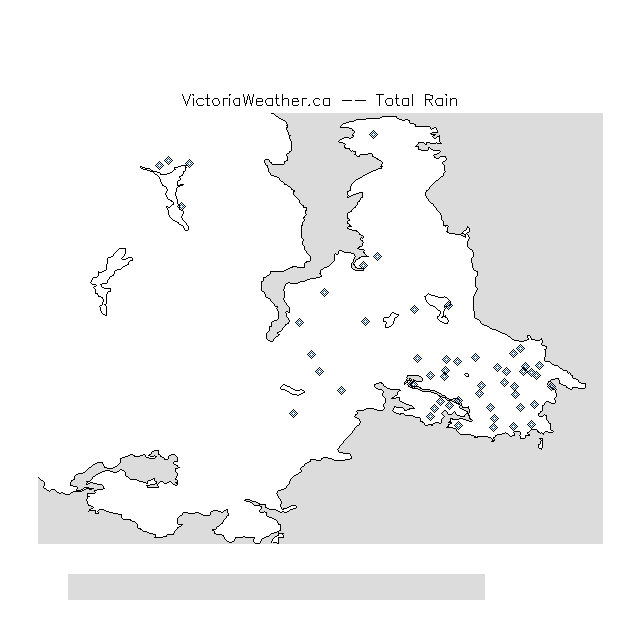 The total rain is shown (measured in millimetres, mm, since the previous midnight). 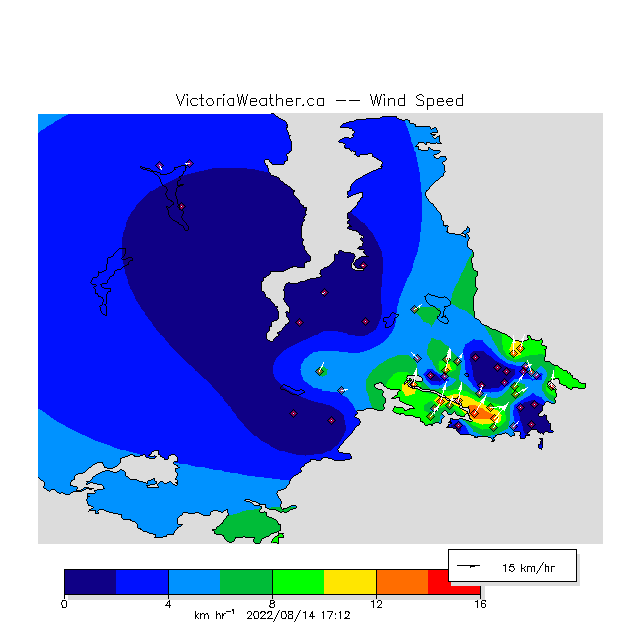 Wind speed is plotted with an interval of two kilometres per hours (kmhr-1). The direction of the wind is shown with arrows plotted on each observation location. The length of the arrows is scaled by the range of observed wind speeds. Wind power density is a measure of the power available to wind turbines with unit cross-sectional area. The wind power density is proportional to the cube of the speed. This page took 163.5 ms to generate. Last Modified: March 14 2016 15:13:23.